The opening weekend of the tournament is fast approaching with a couple of standout fixture. France entertain Wales on Feb 1st and on Saturday, Scotland host Italy before Ireland and England clash in a game which looks like a massive physical contest already. Hawkeye Sidekick looks at each side’s expectations for this tournament. The expectations will be to retain the championship but it is a tough ask with progressively improving England, Scotland and Wales on the schedule. No grand slam this year. If the championship is off the table, perhaps it would be wise to get more game time for squad members who are vying for those final spots for RWC 2019; solidify squad selection ahead of Japan later in the year. The scrum half options are looking stretched with Marmion, McGrath out of the selection plans for now. Blade comes into the squad as third choice and it is an superb opportunity for John Cooney to secure valuable ground on Marmion and McGrath in the battle for the backup scrum half berth. The final goodbye for Warren Gatland and this tournament. An end of an era for Wales this season as Wayne Pivac and Stephen Jones take over the national team reins after RWC 2019. I sense that this will be a superb championship campaign for Wales. A couple of injuries but the squad has the right blend of youth and experience. The pack looks formidable with Owens, Lee, Jones, Tipuric in fine form at present. The half back options look really good with an explosive back line containing Jonathan Davies in the three quarters to game manage and then you see Jake Ball coming back from injury against Leinster Rugby last night, squad depth will be boosted by the end of the tournament. They would be my pick for the tournament. No grand slam but they have Ireland at home which could be a winner take all fixture finale. 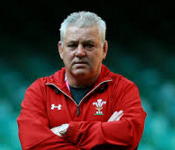 Gatland may get his hands on the 6 Nations in his season finale with Wales. England have the talent pool to be a viable contender for the championship but discipline issues still are a question mark for me. The back three will need to improve their aerial ability; it will be tested next weekend in Dublin. The plus point is the pack setup. Their set piece should be extremely strong with Maro Itoje playing superbly well for Saracens this season. The pack contains the Vunipola brothers who will provide platform ball for the half backs. The fitness of Owen Farrell is a concern heading into the tourney. Eddie Jones will look to unsettle opposition teams and officials with pregame comments; there will be some good sound bites too but the pressure is on Jones ahead of the RWC 2019. Another mediocre tournament showing here and his position could be under serious threat before departing for Japan. The injury list is big and Gregor Townsend has been forced to shuffle the squad personnel for this tournament. I think it is a blessing for Scotland; make decisions on the RWC 2019 squad and further confirm the depth charts across the side. What to expect from Scotland? High tempo attacking offload game. The players are well suited to the game plan and they will look to expose defensive lapses from anywhere on the field with Stuart Hogg and Blair Kinghorn in the ranks. The issue is potentially the pack. The set piece at times could be under considerable pressure from the likes of England, France and Ireland. How will Scotland improve their maul defense? It was exposed last season in this tournament. A strong showing against Italy next weekend is a must. Serious limbo. Serious anarchy in the French national side. Brunel is throwing the dice with this squad selection with Ntamack leading the squad selection sheet as a marquee player even though he is yet to be capped. We are fully aware of France’s player pool, talent and ability to play off the cuff but the squad and team have suffered so much in cohesion issues in recent years. Players come in, players go out. No continuity and the team has suffered. What am I expecting? Strong set piece execution with a mixed bag in open play. The half back pairing is up in the air. Who does Brunel go for? Less than twelve months from a RWC and there are still massive questions on the first team selection let alone the squad. Wales at home on Friday night is the most important game for France in over four decades; a loss here and this spirals out of an uncontrollable tailspin. A nation will look on with interest, fear and intrigue all in equal measure! Italy will not win this tournament. Italy probably won’t finish in the top three but for Conor O’Shea, there needs to be viable signs of improvement and optimism going into the RWC 2019. The Benetton Rugby’s resurgence this season should provide momentum for the national side but the international test match arena is a different animal and their defensive organization was cut to ribbons in November. Abrasive pack phases but precious little in attacking play in the back line. Scotland on the road to start the tournament. A key fixture to see how Italy fare; they will be buoyed by their performance last season when the two sides met but lack of composure and game management to close out the fixture was punished by Scotland’s late push. Improvement is the key here, otherwise Italy enter into the run in for the RWC 2019 with minimal confidence and optimism. Let’s hope for the tournament organizers that they can win a game here; otherwise the Georgia debate will surface yet again! Munster Rugby secured top spot in Pool 2 with a nerve jangling, tension filled 9-7 victory over Exeter Chiefs at a sold out Thomond Park. Hawkeye Sidekick was in attendance and reflects on the fixture twenty-four hours on from the result. 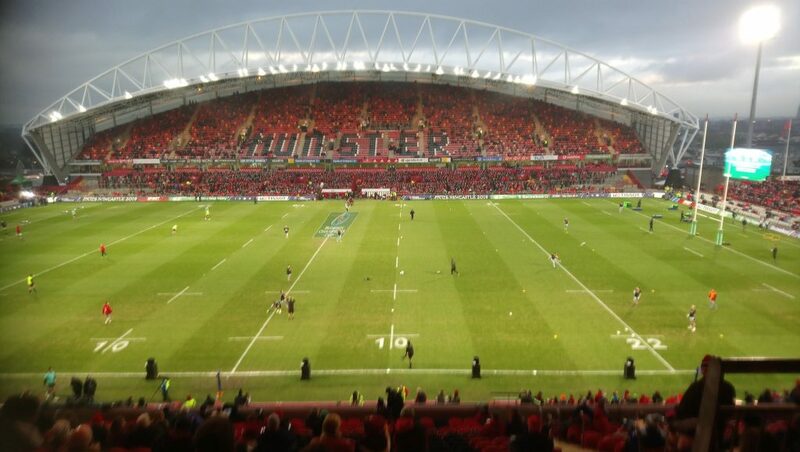 There was a sense of expectancy in the air around Thomond Park pregame as supporters of both Munster Rugby and Exeter Chiefs mingled in the fan zone and club houses adjoining to the hallowed venue. The warm up sessions from both sides was an indication of how the contest would go; both pack units executing set piece drills with increasing velocity. Stand Up and Fight sung by Jean Wallace lifted the roof off the West Stand as the atmosphere cranked up to the maximum. The scene was set for the pool 2 decider and the early exchanges were brutally physical and abrasive. Both sides looking for potential weaknesses with early attacking phase play but line breaks were at a premium. Munster Rugby opened the scoring on six minutes with a Joey Carbery penalty straight in front of the posts after good work from the Munster Rugby pack. Stander ripping the jersey from an Exeter Chiefs second row to highlight an offside indiscretion as the maul progressed with interest. The end of this play saw Conor Murray go down with an apparent shoulder injury but the scrum half continued in the contest. If the home supporters thought that this would be another cakewalk end of pool home game fixture, they were duly put on notice as Exeter Chiefs response to the opening score was emphatic on thirteen minutes. A crunching hit on Peter O’Mahony causing a turnover and after Niall Scannell was pinged at the breakdown, Exeter Chiefs had no hesitation to go for the corner. Simmonds’ kick was on the money and it was maul time for the English side. The maul was brought down just on the Munster Rugby line; with a penalty already secured from that collapse, Don Armand crashed over after good recycling and phase play. TMO was called to confirm and the try was given. The conversion was emphatically kicked over by Simmonds and Munster Rugby were behind. The remainder of the half saw a cat and mouse battle ensue. Exeter Chiefs making sure that their exit strategy was clinically executed. Nick White must be applauded for his kick game as time after time, his kicks gave his colleagues maximum time to chase and close down the Munster Rugby ball receiver. The breakdown battle was chaotic. Exeter Chiefs disrupting Munster Rugby ruck ball. With Garces content to let the breakdown battle turn into a free for all, Munster Rugby were increasingly getting isolated in their ball presentation and Conor Murray needed to box kick more frequently that anticipated with mixed results. Exeter Chiefs were rattling Munster Rugby in their line speed, breakdown work and kicking game. This fixture was now a test of Munster Rugby’s ability to execute their attacking game plan. The pack ball carries were struggling to create holes in the Chiefs defense and as a result, there was an air of panic at times with some of the attacking plays run by Munster Rugby. It resembled at times their performance against Racing 92 in Bordeaux last season. With Munster Rugby not getting any joy in the way of attacking gain line breaks, it came as a relief that the home side front row won a penalty for an emphatic scrum drive on twenty minutes. Joey Carbery’s kick was unerringly accurate and the gap was now down to a point. 6-7. Exeter Chiefs continued to probe with mixed results. Jack Nowell at full back looking most likely to create attacking opportunities from his full back position. Their persistence to kick deep into Munster Rugby territory was having good rewards and more indecisive Munster Rugby game management with ball in hand saw the English side in prime position to score more point on forty minutes only for quality breakdown work allowing Stander to run the ball out into touch. There was an increasingly air of the nervousness in the stands at half-time. Munster Rugby’s pack platform had not materialized. As a result, the attacking game plan was neutralized by Exeter Chiefs. The kicking game was been won by Exeter Chiefs; adjustments were required from the hosts. The second half saw both sides have potentially promising moments. The game was preciously offering little in terms of expansive play. This was a proper arm wrestle; a game of attrition, a game of sheer physicality as both sides battered the other with minimum creativity. Brawn was the order of the day. Munster Rugby on video analysis will look to key contributions of a number of personnel in the pack. Tadhg Beirne in the third quarter was outstanding, his jackal positioning over the breakdown winning three penalties to launch attacking platforms. CJ Stander ball carrying and tackle count setting the tone. Exeter Chiefs continued to threaten with their attacking maul a key threat. More points were turned down by the visitors heading into the fourth quarter as they looked to turn the screw to secure a decisive second try. The game was becoming more and more frayed for the hosts as Murray and Conway had good opportunities denied by superb last ditch defending. Cue the key moment of the contest. Tadhg Beirne departed the pitch and was replaced by the ever reliable Billy Holland. A line out five meters out from the Munster Rugby line. The defensive line out was ditched and the decision was to contest the line out. The risk was clear; lose the line out and the try was almost certainly conceded. The lift from Loughman and Stander for Holland was outstanding; the steal sublime and the energy in the crowd was reinvigorated as the home supporters rose in unison to applaud the play. The line out steal was a key moment as Exeter Chiefs were now losing the gain line battle to Munster Rugby. Phase play was more direct from the hosts and there was more urgency in ball presentation and quicker ruck ball from Mathewson upon his introduction. Dan Goggin and Arno Botha starting to see more ball carries and creating more gain line breaks. It set the platform for the key penalty award on seventy minutes. Exeter Chiefs pinged in the line out and there was no hesitation from Carbery to go for the posts. His kicking was emphatic and the Thomond Park faithful roared the kick over. 9-7 and suddenly Exeter Chiefs need to change their game plan to get back into the contest. However, Munster Rugby defensively have to be applauded for a disciplined performance in those closing stages. Their line speed was on point and their decision to commit to the breakdown was superb. Rhys Marshall was a key cog in several defensive plays. The New Zealand stalking the ball carrier and making several key hits resulting in lost gain line yards for Exeter Chiefs. Exeter Chiefs from been just outside the Munster 22 were now back on the Munster Rugby 10 meter line. Their attacking passing moves were rather static and moving ponderously from side to side culminating in Munster Rugby exposing an Exeter Chiefs player and putting him into touch. Garces blew the final whistle. Palpable relief. What did we learn last night? The determination, grit, hunger and sheer desire to win this contest from Munster Rugby was to the fore. They lost the territory and possession battle. They lost the open kicking game but Munster Rugby refused to wilt and Exeter Chiefs like so many other teams who come to Thomond Park were caught at the death and lost the contest. The breakdown was a mess. Garces and officiating crew should have handled this area of play better but it clearly rattled Munster Rugby in their ability to launch attacks. The attacking game plan was frantic at times; rushed game management decisions with ball in hand all too common. The ferocity of the breakdown will continue to be like this in the quarter final; coaching and player review of this area is required. The Munster Rugby scrum did go well last night and should have yielded more reward. There was at least three scrums where Munster Rugby were unlucky not to win penalties. Kilcoyne, Scannell and Ryan provided a solid set piece throughout. The maul defense improved massively after Armand’s try. Exeter Chiefs kicking game plan caused Munster Rugby massive issues. Haley was assured under the high ball but there were clear cohesion issues in how Munster Rugby players were slow to support their full back for a possible offload. This needs to improve as the business end of the season fast approaches. A hard fought win, a gritty performance but Munster Rugby management will realize that the level of accuracy with ball in hand has to improve dramatically by the time the side travel to Murrayfield at the end of March to face Edinburgh Rugby side. Challenge Cup for once looks exciting! If you are a regular reader of this blog, you will know that this competition grates on me for many reasons. However, the tournament’s pool phase concludes next weekend with several decisions still up in the air. Hawkeye Sidekick reflects on where we are and tries to predict what may unfold. Who will make the quarter finals? The only side who are guaranteed a home quarter final is the top seed ASM Clermont Auvergne. The French side secured top spot in their pool with an exciting 48-40 win over Northampton Saints. After that, it is a mess with several sides still in contention for a late quarter final playoff. Looking at the fixture list next weekend, La Rochelle if serious about this competition should account for Zebre Rugby on the road; anything else and they could be sensationally knocked out of the competition. Sale Sharks host a hapless Perpignan who have not won in a while; expecting a bonus point try win early from the Manchester based club. Worcester Warriors have won the pool and are at home to Stade Francais who may play a second string squad for the fixture who have a remote chance of making the final playoff berth. Worcester Warriors have been methodological and should do the job based on good set piece and superior work rate. Harlequins travel to Agen on Friday night. 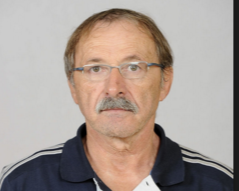 Agen will be delighted to see the back of this tournament; they perennially despise this competition and they will be popping the champagne corks after the final whistle. Their focus is and always will be Top 14 survival. Quins if they perform should secure a bonus point try win here with ease. Bristol Bears and Northampton Saints have routine home fixtures against Enisei-STM and Timisoara Saracens respective. BP try wins beckon and passage to the last eight. The only team who look vulnerable and I say this because Bordeaux-Begles have played well in the tourney in recent weeks is Connacht Rugby. The Irish province had a superb 20-18 win over Sale Sharks last weekend. Bordeaux-Begles may decide to call upon several first team stars and their abrasive pack may mean that this game is in the melting point until the third quarter. Cool nerves are required from Connacht Rugby. If Connacht Rugby were to lose, then Benetton Rugby would be main benefactor. The two vulnerable teams for me on this final weekend are La Rochelle and Connacht Rugby but I think they are playing sufficiently well enough to get results on the road. Exciting pool finale beckons next weekend! The fifth round of Heineken Champions Cup is now in the books. Several sides’ ambitions to advance to the playoffs officially extinguished while others move onto next weekend and a weekend of destiny. Hawkeye Sidekick reviews the permutations which may unfold next weekend. The debate on home quarter final berths was decisively answered this weekend. Saracens remain unbeaten in pool phase play. Their bonus point try win over Lyon on the road means that they are the number one seed right now with a home fixture against Glasgow Warriors scheduled next weekend. Racing 92’s two point haul on the road to Ulster Rugby yesterday means that they hold the second seed. Racing 92 will fancy their chances of securing a win over a Scarlets side at home with precious little to play for; a potential bonus point up for the grabs. Leinster Rugby made an emphatic statement, demolishing Toulouse minus several marquee first team starters. Wasps on the road will be interesting but the manner of the performance yesterday in the RDS means that the reigning champions should secure the third quarter final berth. Any dramatic twists expected on the home quarter final berth? We are down to the last home quarter final berth and it could be decided as soon as Friday night at 10pm. The equation is simple. If Edinburgh Rugby beat Montpellier, they secure the final home quarter final spot with a minimum of 23 points. A Montpellier game opens the home quarter final berth up for grabs on Saturday! The side who would avail of this scenario is Munster Rugby but they are faced with a tricky encounter at Thomond Park as Exeter Chiefs still have a chance of pool progression. Exeter Chiefs’ mission is simple; beat Munster Rugby without allowing the Irish province any points. Tough task but no better than Exeter Chiefs to embrace and go for broke. Munster Rugby impressive in their win over Gloucester Rugby on Friday night need to secure a bonus point try win to hit the twenty-two points mark. This may still not be good enough to secure the home quarter final berth but that is the aim right now. The Battle of Castres and the lack of officiating on that December night may come back to haunt Munster Rugby, Wayne Barnes and the EPCR organization. A home quarter final dashed. The pressure may build for those currently in spots six, seven and eight spots if Montpellier were to upset Edinburgh Rugby on the road. Given Montpellier’s road trip woes, it looks an arduous task but let us look at the impact if the French side did pull off the upset win. Montpellier would jump to min (20 points) / max (21 points) and win Pool 5. Edinburgh Rugby are currently on nineteen points at present and you would expect them to add to that tally. They should advance to the quarter finals. Who may need be vulnerable if this scenario plays out? Ulster Rugby travel to a Leicester Tigers who are devoid of confidence. It is the best opportunity for Ulster Rugby to secure a road trip win at Welford Road and with a Tigers squad looking at Gallagher Premiership survival, a bonus point try is potentially on the cards. Ulster Rugby should be safe. Glasgow Warriors head to Saracens; arduous mission to secure any points from this fixture. Glasgow Warriors do have nineteen points in the bag; that might be enough to secure a ticket for the big dance but it all depends on Edinburgh / Montpellier on Friday. 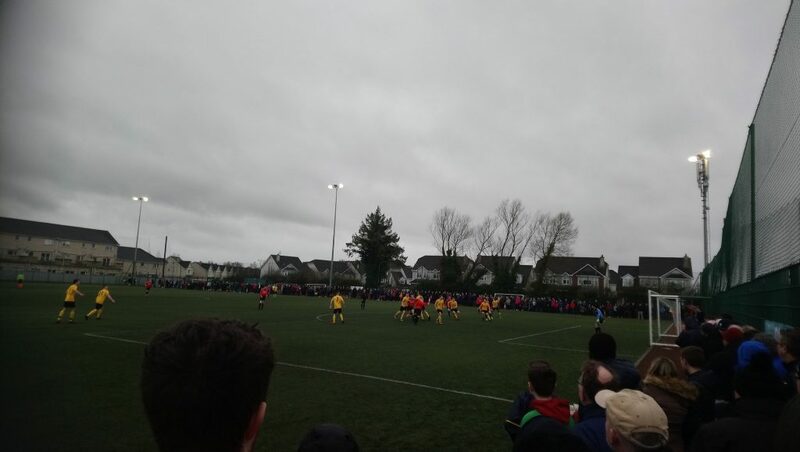 Aisling Annacotty advance to the last sixteen of the FAI Junior Cup as a late Aaron Murphy header broke Newport Town AFC hearts in a high energy, competitive encounter in Annacotty. Hawkeye Sidekick was in attendance and reports on a 2-1 triumph for the Limerick District League Premier Division outfit. As soon as the draw was made in early December, this fixture stood out for anyone in the Midwest. Aisling advanced to the last thirty-two of this competition with an excellent 4-0 win over Blarney Celtic on the road. Newport Town AFC who play in the Limerick District League 1B advanced to this stage of the competition courtesy of a nail biting penalty shootout win over Carbery (Sligo) at home. The form book suggested that Aisling Annacotty would have too much quality for Newport Town AFC but the romance of the cup never dies and the 1B outfit set about their task from the first whistle with organization, determination and skill. The Tipperary outfit were the dominant side for the opening exchanges; winning the second balls and with the ever dangerous Christy Doyle upfront posed a threat for the hosts defense. Davy Ryan on the flank for Newport Town AFC had a strong opening and his link up play setup Doyle for the first chance of the game on eighteen. Doyle’s rasping drive brilliantly kept out by the Aisling Annacotty net minder. Newport Town AFC were compact and creating further chances as Doyle again tested the home defense with a header on thirty minutes. A good start from the visitors was undone on thirty-three minutes as Aisling Annacotty took the lead with their first realistic chance of the game. Good work down the left flank caused chaos in the Newport defense, the ball was cleared but the second ball was headed back towards goal where Jason Lipper was on hand to nail home taking advantage of lack of defensive tracking from Newport. The finish was tidy, little time to set himself as Jimmy Fyffe came quickly out of his goal but the header was decisive. 1-0 Aisling. A local derby was always going to see some cards issued by the man in the middle and so they duly came. The most significant of those yellow cards was on 37 minutes when Christy Doyle was given a yellow for cheekily heading the ball out of the Aisling keeper’s hands and putting it in the net. That card would become a key talking point as the game wore on. Newport Town AFC buoyed by a strong away support responded well and more good play down the right flank nearly saw the Tipperary side win a penalty. Doyle brought down just outside the edge of the box, the subsequent free kick was saved but the threat from the visitors was still abundant to the locals in attendance. Half-time: 1-0. The opening period was at times cagey with both sides content to sit back and see what the other side would do. The middle third was quite congested but the second half started with good tempo with both sides making encouraging attacking breaks. Half chances for both sides in the opening exchanges as the game was opening out. Aisling Annacotty’s young side looking to hit Newport Town AFC on the break but the Tipperary side were dealing with the threat and duly equalized midway through the half. The goal was all about Davy Ryan as his incisive run into the box and lay off left Christy Doyle with the chance and the effort was emphatically placed to the right hand corner. 1-1. The away support roared with approval. Game on! Heading into the last twenty minutes of the contest, it was a 50/50 contest. Aisling responding well to the concession of the goal and started to make advances to the Newport Town AFC goal. Cue the key incident of the game. Christy Doyle who was ever dangerous for Newport Town slid into a tackle and with a yellow card already to his name, he needed to get the tackle spot on. Unfortunately for Newport Town AFC, he was slightly late and the match officials after taking time to consider their decision issued a second yellow card. Newport Town AFC down to ten players. Advantage very much with Aisling Annacotty. The player advantage initially did not hinder Newport Town AFC as the O’Sullivan brothers continued to take the fight to their opponent with some lung bursting runs from deep. The 1B side were continuing to make the tackles and their defense were well organized until five minutes from time when Aisling Annacotty struck the front. Newport Town AFC will reflect on how the goal was conceded. A cross from the right flank was delivered just in front of the defense and goalkeeper. It forced Newport Town AFC defensively to make a decision. Jimmy Fyffe made the call to come out but was just beaten to the ball by Aaron Murphy who headed superbly into the net. Cue home celebrations! 2-1 Aisling. A devastating goal to concede. The 1B side punished again for another defensive lapse. The fine margins in a cup tie highlighted by the goal. Newport Town AFC tried to respond and only for a last ditch tackle from Aisling Annacotty, an equalizer could have been scored. On the other side, Aisling could have scored a third only for a smart save from Jimmy Fyffe as Newport Town AFC went for broke. The final whistle was greeted with relief by Aisling Annacotty. Their young side had won, the performance at times lacked composure but their resiliency to keep in the contest and wait for their opportunities was impressive. Jason Lipper, Brian Butler, Aaron Murphy stood out at different intervals. A key win for the side whose young age profile bodes well for the future. Newport Town AFC were a credit to their division. The 1B side performed superbly well and belied their league divisional status. They matched their Premier Division opposition for long periods and to a man played with work rate, determination and attacking menace. The red card was a sickening blow and the game winner was cruel luck on the side who provided much to an exciting local derby. Aisling Annacotty advance to the last sixteen. The facilities were first rate and the manner in which the club is been run and the future plans means that the Limerick club are primed for success on and off the pitch for years to come. This result will increase morale and confidence in this young group of players ahead of a busy Premier League calendar block. Newport Town AFC romantic run ends in the FAI Junior Cup but the memories of this cup run will be remembered for years to come. The penalty shoot out win over Carbery a season highlight. Derryleigh Park is a fine venue and with the incredible support from Newport, the club’s future looks bright. The players in the side need to kick on now and secure 1B promotion. The season cannot die now. The travelling support was considerable and added plenty of atmosphere to the occasion.